Civil Litigation - Scammell & Co. The following notes provide a step-by-step overview of the litigation process. The stages of litigation may vary from jurisdiction to jurisdiction. Also, settlement can occur at any time, even after trial. Click on the relevant term below to reveal a description. The Notice is a formal and detailed letter sent by the person or company who wishes to bring a claim (usually called the Plaintiff) to the person or company that they wish to claim against (usually called the Defendant). The Notice sets out what the claim is, for example a claim for money owed or property to be returned. The Notice also states the Plaintiff’s intention to take the matter to court. The Plaintiff must usually wait from 21 to 90 days after sending the Notice before proceeding to the next step in the litigation process, (step 2 below). Many disputes settle in this time, avoiding the cost and delay of going to court. It must be issued out of an appropriate court which has jurisdiction to deal with the matter described in the summons. It will be addressed to the person against whom the claim is brought. (The Defendant) It will usually be accompanied by a document known as a ‘Statement of Claim’. A statement of claim sets out in some detail why the Plaintiff is bringing the claim and what orders the Plaintiff is asking the court to make. After the summons has been filed in court, it will be sealed by the court and usually returned to the plaintiff to arrange service on the party to whom the summons is addressed (the Defendant). In some cases the summons must be personally served on the Defendant. In other cases it is sufficient to send it to the Defendant’s address. After a Defendant has received a summons he / she or the company is allowed a period (usually 21 days) in which to file a Defence. That is a document setting out why he /she does not agree that the claim should proceed. The statement of claim and the defence when read together enable the court to know what it is that the parties are arguing about, and to have some idea of what evidence will be presented if the matter goes to trial. Both the statement of claim and the defence are important documents which must be very precisely prepared. A party would not normally be allowed to present evidence in court that is outside the matters identified in the statement of claim and/or the defence. If the Defendant does not file a defence then after the time limit (usually 21 days) has elapsed the Plaintiff may ask the court to issue a ‘default’ judgment against the Defendant. As part of the preparation of a case for trial both parties are required to provide a list of the documents which are in their possession, which may have any relevance to the matters coming before the Court. Such a list must be exhaustive and must not hide anything. This discovery, in many cases, may only be 20 or 30 pages, but in other cases can be thousands of pages. In some cases the parties may file written questions in court requiring answers by the other side before the matter proceeds to trial. Parties to a case can, if they so wish, file a document on the other side requiring the other side to admit certain facts or documents and, in effect, say that those matters which are admitted do not need to be dealt with by formal evidence at the trial. This can sometimes save time and expense at the trial. 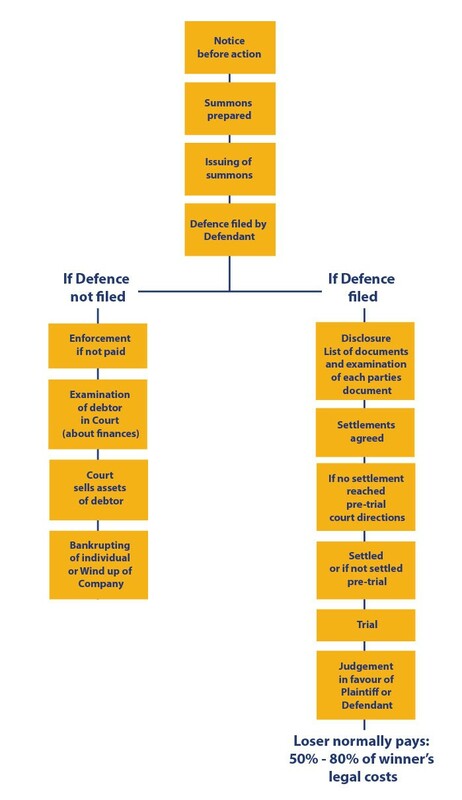 Once a defence has been filed the court will nominate a time when the parties must come to the court and discuss before a judge the preparation of the matter for trial. These are usually five or ten minute hearings and may be adjourned for a period to allow certain steps to be taken before coming back before the judge to be again considered. A matter will not be allowed to go into the trial list until the judge is satisfied that both sides have adequately prepared their evidence for presentation to the court. Before the matter goes to trial the Court will normally direct the parties to attend before the judge in person with their solicitors. The judge will discuss with the solicitors and the parties whether the matter can be settled without needing to go to trial. This is known as a pre-trial conference. Finally, if the matter does not settle, it will be sent by the Court to a listing conference which will be attended by the solicitors on both sides. The court will fix a date that suits the court, the solicitors and barristers on both sides, the parties and the witnesses. For this conference it is necessary to make an estimate of how long the trial will take and to discuss any special arrangements for witnesses that may be coming from interstate or overseas. The great majority of matters are settled before any trial occurs; less than 1% actually proceed to trial. The 1% which do go to trial are those where both sides strongly believe they will win. Half of them are wrong. All litigation is risky. Those matters that do proceed to trial must wait their turn in the court’s trial list which can often mean waiting for many months or even up to a year. After hearing the evidence of a trial, a judge may give a judgment straight away or may wish to consider the matter further before giving a decision. This can also, on some occasions, result in further delays of several months. A party who is not satisfied with the judge’s decision may, on some occasions, be able to appeal to a higher court to have the decision of the judge in the lower court reviewed. Once a court has made a final order, whether it be after a trial, by a default judgment or after an appeal, the party who is successful is then entitled to enforce the judgment (which usually includes an order for payment of that party’s legal costs by the other side). Enforcement can take many forms including seizure of property, summons to appear in the debtors court and/or bankruptcy. On some occasions with the consent of both parties, the Court can direct that the matter go to mediation in an attempt to settle it before it goes to trial. This means something similar to a settlement conference but is much more in depth and may take anything from half a day up to several days. A mediator who is usually a qualified barrister or a judge can make recommendations to the parties as to how the matter should be settled but cannot make any actual orders. On some occasions a Defendant may say that he is entitled to be indemnified by a third party in respect of the matters claimed against him by the Plaintiff. In that event the Defendant will issue what is known as a third party notice and which is in effect a cross-summons to bring in a third, fourth or fifth party. Where there is more than one Defendant in an action the Defendants may seek orders from the court as to the proportions in which any liability they may have to the Plaintiff should be adjusted between the Defendants. This is done by filing a contribution notice which again is something like a cross-summons against each other. Where a Defendant admits part of a claim but denies another part they may file an offer for that part of the claim which they admit. For example, a Defendant might be sued for $50,000 and say that they admit $15,000 only. They can then file an offer for $15,000 plus costs up to the date of the filed offer and defend the balance of the claim. Should the trial proceed and the Plaintiff only get an order for $15,000, the Defendant, in effect, wins the matter on costs because he can say to the court “I was always willing to pay that amount and there was no need to have a trial”. This shifts the costs risk onto the Plaintiff. Until the trial is over the judge is not aware of the filed offer. Either party can file offers from time to time with differing costs benefits. Generally speaking a successful party in an action is awarded costs against the other party (which are usually much less than the actual legal costs incurred). It is important that if you have a claim that you do not delay in pursuing it. If your claim is for personal injury, the law says that you must begin the litigation process outlined above within three years. If your claim is under contract or relates to property damage, you usually have six years in which to begin the litigation process outlined above. If that time has passed, only in exceptional circumstances will the court allow you to enter into litigation to try to recover your claim.